Real Absinthe can be purchased online at ALANDIA. This is the best way to buy a bottle of authentic Absinthe as you usually can not find real Absinthe in your local liquor store. They often sell cheap mass-marketed fake Absinthes. Real Absinthe should be made with wormwood and ideally it should not be artificially colored. 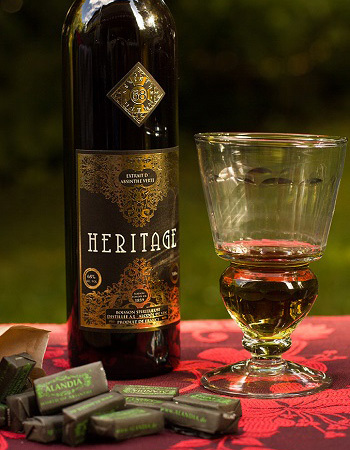 At the ALANDIA online store you can purchase from a large selection of original Absinthe. If you directly want to know more about the specific brands, just click on the photos of the products below. Your Absinthe purchase is safe and convenient if you order the Green Fairy through the online shop ALANDIA. The shop was founded more than 15 years ago, meaning that we serve the Absinthe Community since 2001. We offer a large selection of different styles of original Absinthe glasses, Absinthe spoons, Absinthe posters and other Absinthe accessories like beautiful Absinthe fountains. The Green Fairy, how Absinthe is also called, has a long and fascinating story to tell. With your first Absinthe purchase you will step into her fascinating world. Is it safe to purchase Absinthe online? Yes, because first of all Absinthe is legal. Secondly, if you order at our online store ALANDIA, the delivery is 100% guaranteed. This means if anything happens during shipment (breakage etc.) we will refund you your money or reship. Whatever you prefer. There is absolutely nothing you have to worry about. ALANDIA was already established in the year 2001, therefore we can look back at a long company history. This means as well, that we have have gathered a lot of experiences in regard of shipping and handling of the Green Fairy. All of our shipments are as well fully trackable, this means you automatically receive your tracking number via email, as soon as your order is shipped. Therefore you always know, when to be at home to welcome the Green Fairy :-). For your first meeting with the Green Fairy you need to buy an Absinthe glass and an Absinthe spoon plus sugar cubes. These are the essential accessories to drink absinthe the proper way. At our store and as well here on the info site you find a video explaining the classic Absinthe ritual with water and sugar. We highly recommend that you purchase these accessories as well with your bottle of Absinthe. Because only then you can experience the Green Fairy the right way. Purchasing Absinthe, is it legal? Yes it is, as Absinthe got legalized almost everyhwere in the world. In the USA, Switzerland, Europe, Japan and Australia the historical drink of the 19th century can be legally purchased and consumed. That is as well why we can sell it again. In our online store you can order real European absinthe made with wormwood. And yes, these brands contain thujone as well. We sell what was drank in the 19th century. If you want to know more about Absinthe & Thujone, check out our info site.Of course you have to be of legal drinking age to buy Absynthe or Absinth (alternative spellings) at our store. We also recommend that you drink Absinthe responsibly, it is a very strong liquor with 68% alcohol by vol. / 138 proof. Therefore you should never drink this strong green spirit neat, you always have to drink it with water and according to your preferences with some sugar. You can easily purchase a bottle of the real Green Fairy online at ALANDIA. It doesn't matter if you are searching for Absinthe spoons, absinthe glasses, absinthe fountains or anything related to the Green Fairy. Why? Because ALANDIA offers it all, you can purchase it easily online at our shop. It is the one stop shopping experience for the world of Absinthe. And you will see, all the products are so tempting. You want to have them all. If you need some advice in terms of which brand to choose, check out the absintheur reviews in the shop or consult our Absinthe bestseller list. If you don't exactly know how to drink Absinthe the classic way, just watch the following ritual video. And if you like to see, what the official Absinthe of Marilyn Manson looks like, check out the designated info site.